Weight no less than 4.5 Kg. The curing process at an altitude equal to or greater than 800 meters.  The whole preparation process takes place in areas within the province of Teruel. Hams are long and sharp shaped, with rounded edges, and the hoof is kept. The meat is red coloured and shiny when cut, with partial fat infiltration in muscle tissue. 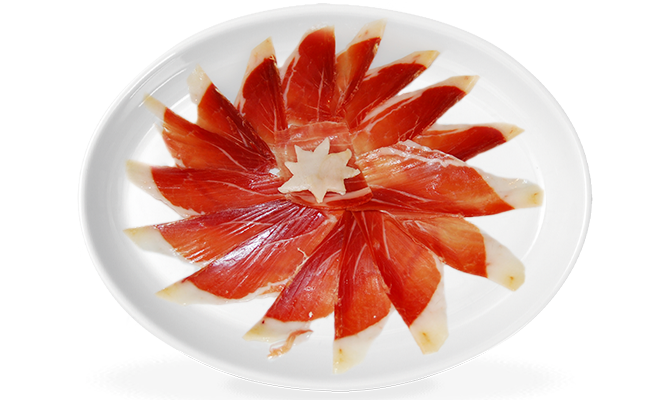 Delicate taste, very pleasant, and barely salty, thanks to the lower salt content used in the preparation process, in which dry salt and very low temperatures are used to pile hams. The fat has a greasy consistency. It is of a shiny, yellowish-white colour and is strongly flavoured, with a pleasant taste. Minimum duration of the whole preparation process is 36 weeks. Hams can either have its whole skin or show a "V" cut. These hams are only and exclusively obtained from Landrace, Large White breeds, or from a crossbreed of both of them (maternal line) and Duroc (paternal line). All of these must be packaged in drying sheds and packaging premises located within the preparation zone, and must meet the requirements laid down in the general specifications as well as satisfying quality control and certificacion procedures.